Renault's executive director of engineering has revealed that, apart from the new aerodynamics, the reduction in weight has been one of the major challenges ahead of 2009. Because of the introduction of KERS, the pay-off for being able to freely move ballast is higher than ever before. I think the primary thing we can say is that it’s the biggest challenge for a long, long time. We’ve had reasonable rules stability for the last few years. Yes, we changed to the V8 in 2006 - I suppose it was quite a large change - but not a terribly difficult one from a design point of view. The aerodynamics were stable for a long time, so we had continual development, little bits of trimming to pull performance back: lift the front wing, drop the diffuser – little bits like that, which are quite trivial. This year, we’ve had a completely new concept of aerodynamics to look at, different in just about every respect. The wings are used completely differently, the bodywork has huge restrictions, and the diffuser is completely new. So it’s really a clean sheet of paper. The teams will have to learn again where the sensitive areas are, where they can find gains, where they can push regulations, and where the regulations stop them from thinking in the way they used to think. Then, on top of that you’ve got KERS, which is not only a new system to integrate but also a completely new technology for all of us to assimilate. None of us has worked with power electronics, with high voltage systems, before. Our experience of electric motors is fuel pumps and other small devices. We’ve never worked with advanced battery technology and very high voltage systems. As well as that, how do you take a considerable amount of power, 60 kilowatts, and use that strategically to best effect in qualifying and racing? There are all sorts of things to think about in fact! Is this one of the most challenging seasons you’ve seen from an engineering point of view? 1983 flat-bottomed cars. The ING Renault F1 Team pushed the development of the R28 to the last race in 2008. In what way was that a disadvantage as far as the 2009 programme is concerned? That’s not completely true. Our last major introduction was the new front wing for Singapore, for which the aero work was done much earlier. We recognised that the 2009 car was a big aero project, so the work on the R29 started very early. We then looked at critical aero concepts in basic areas: where things worked, where things didn’t. You know, how good a job you’ve done is a relative thing: it only matters in relation to how other people have done and most people have had to follow a similar plan to us. I’m pretty confident we’re going to have a car that’s aerodynamically up at the top. What can you say about the philosophy behind the R29? of our ability to move weight distribution around on the car. In other words, most of our ballast has gone. Therefore, the design philosophy has focussed on two things: one, get the car even lighter, because the payback for getting weight off the car has become even greater; and secondly, get the weight distribution right first time for the slicks. We ran those tyres in the summer so we got a bit of an idea of their characteristics. 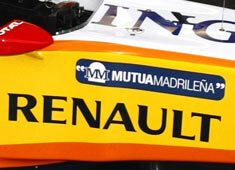 Fernando will once again be a Renault driver in 2009. How valuable an asset is he to the team? Well, first of all, he’s an incredibly quick driver. When you’re making your list of what you want from a racing driver, that’s at the top of the list. In my view, he’s the quickest guy out there; he knows how to win and how to race. He knows what he needs to do. He will provide continuity to the team. He’ll be the guy who can say ‘okay this is what I’m used to, what I’m not used to, what I like, what I don’t like.’ And we don’t have to translate what he says into our engineering language because we already know that translation as we’ve worked with him before. He can provide that transparency of thought, which is so important to development.